label Optional label to display in front of the field. value The curve to edit. color The color to show the curve with. ranges Optional rectangle that the curve is restrained within. AnimationCurve The curve edited by the user. Makes a field for editing an AnimationCurve. 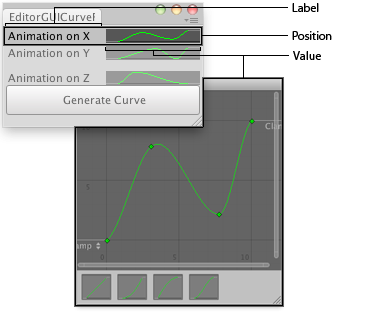 Curve field in an Editor Window. property The curve to edit. label Optional label to display in front of the field. Pass [[GUIContent.none] to hide the label.